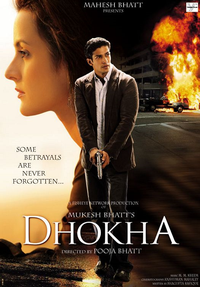 Review Summary: DHOKHA is a well-made film. At the box-office it's for multiplexes of big centres mainly. DHOKHA is a well-made film. At the box-office it's for multiplexes of big centres mainly. This film though average, comes as a big surprise. Not just the story, but also the way it tries to bring forth a sensitive and volatile subject of Islamic fundamentalism is good. Former director-turned-scriptwriter Mahesh Bhatt [Images] has taken his offscreen image of a 'secularist' much too seriously and has translated it onscreen, in the name of Dhoka.